Former Smiths singer Morrissey has used his autobiography to criticise the UK legal system and music business; and revealed his first full relationship came with a man when he was in his 30s. The star was scathing about the judges in his 1990s legal battle with former bandmate Mike Joyce, describing one as the "pride of the pipsqueakery". The Smiths' record label Rough Trade, he said, had been "brutally drab". And he accused music paper NME of being out to "get Morrissey" in the 1990s. The star, who is normally protective of his private life, opened up about a relationship with Jake Walters that began in 1994. Media captionMorrissey's autobiography: "I never had a proper relationship till the age of 35"
He wrote about how Walters followed him back to his house after meeting him at a restaurant and "steps inside and stays for two years". "For the first time in my life the eternal 'I' becomes 'we', as, finally, I can get on with someone," he wrote. He also revealed how he later discussed having a baby - or, as he put it, a "mewling miniature monster" - with Tina Dehgani, with whom he described having an "uncluttered commitment". Giving his version of his 1996 court battle with Joyce, who was seeking 25% of The Smiths' earnings, Morrissey accused the drummer of "constant inaccuracies and assumptions vomited out with leaden fatigue" in court. This is Morrissey's chance to right every perceived wrong in his life - teachers, the NME, judges (50 pages), John Peel... Even The Thompson Twins, who stopped The Smiths' debut album from getting to number one. However, it is a thoroughly entertaining read, with a laugh-out-loud moment every couple of pages. Michael Stipe is criticised for not brushing his teeth before an REM gig. His primary school teacher is described as the sort "who will never marry and will die smelling of attics". There are revelations: Love affairs with a man and a woman; a thorough analysis of The Smiths' break-up (Johnny Marr was the "master", Morrissey "the servant"); and enough titbits to delight fans (he was a 100 metres champion, turned down a part in Friends, and is a fan of A-ha). There is also beautiful writing. Manchester of the late '60s is described as "an old fire, wheezing its last, where we all worry ourselves soulless, forbidden to be romantic". The group, one of the most revered bands in British music, split up in 1987 after five years together. The presiding judge, John Weeks, came in for particularly scathing criticism, portrayed caustically in the book as an "unsmiling Lord of the Hunt, with an immutable understanding of the world of The Smiths". "The pride of the pipsqueakery, John Weeks begins his judgment by falling flat on his face: He brilliantly announces to the world how The Smiths formed in 1992 - his judicial accuracy not to be questioned!" Morrissey wrote. Geoff Travis, who signed The Smiths to Rough Trade, was another who failed to impress Morrissey. When the singer and guitarist Johnny Marr turned up for an appointment, Morrissey claims he waved them away and refused to listen to their music until Marr "pinned him to the swivel chair". Travis, Morrissey drily noted, "would have found himself wandering from kaftan to kaftan" if it had not been for The Smiths, who the singer claimed "saved his life and made it count in the long run". The singer's bitter and long-running row with the NME began, he said, when a new editor took over and "allegedly called a staff meeting at which he has passed the command that his staff writers must now 'get Morrissey'". In 1992, the magazine questioned whether he was racist after he appeared on stage with a Union Jack. It put him on its cover under the headline: "Flying the flag or flirting with disaster?" The singer also detailed the brutality of teachers at St Mary's school in Stretford, Manchester, where each day was "Kafka-esque in its nightmare". One teacher, he recounted, "stands and stares and stands and stares" at naked boys in the shower, while another was recalled for the way he rubbed anti-inflammatory cream into the young Morrissey's wrist after he had fallen over. "At 14, I understand the meaning of the unnecessarily slow and sensual strokes, with eyes fixed to mine," Morrissey wrote. The autobiography was published on Thursday as a Penguin Classic. It had been due for release in September, but was delayed by what Morrissey described as "a last-minute content disagreement". A pre-fame Morrissey was invited to submit a script for Coronation Street. "I whip off a word-slinger's delight wherein young take on old as a jukebox is tested in the Rovers Return. Swords cross, heads bump and horns lock, and the episode fades with Violet Carson addressing the camera, one eyebrow arched, with, 'Do I really look like a fan of X-Ray Spex?'" The script was not filmed. He attended the opening night of Manchester's Hacienda nightclub, which he said later became full of "disfigured disco dancers and goblinesque pork-pie chubbos with carroty-red curls smelling of pickled pig who claimed the Hacienda as their own public toilet". He first met Johnny Marr after a Patti Smith gig at the Manchester Apollo. The guitarist's first words to Morrissey were: "You've got a funny voice." Factory Records boss Tony Wilson attended the first few Smiths gigs but dismissed Marr's guitar playing, telling Morrissey: "All this Byrds stuff has been done and done." Morrissey and Marr were "as thick as two short planks" when they signed their US record deal with Sire, the singer wrote. "We have no idea what we're signing, in an act of legendary mental deficiency." John Peel supported their debut single Hand In Glove, but the singer has given the credit to Peel's producer John Walters rather than Peel himself. "John Peel did not ever come to see The Smiths play live, and he did not attend any of the radio sessions." Morrissey was miffed that their debut album entered the UK chart at number two, beaten by The Thompson Twins. Someone from Rough Trade told him: "It would've come in at number one but we couldn't manufacture the cassettes in time." Morrissey continued: "My life stinks." Morrissey did not originally like their song There Is a Light That Never Goes Out and suggested to Marr that it be left off the album The Queen Is Dead. "The humiliation I live with, because this suggestion is everlasting since the song became - and continues to be - greatly loved as one of the most powerful components of The Smiths canon. It is often a relief to be wrong." In 1987, after their album Strangeways Here We Come, Morrissey and Marr were "wanting to live yet longing for sleep". Morrissey goes on: "Johnny and I were both drained beyond belief, and there was no-one around us to suggest that we disappear somewhere to rest, and apart. We do not telephone each other for two weeks, and then suddenly the press is rife with Smiths split stories." The Smiths split. 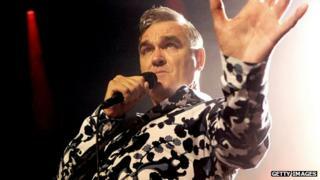 Margaret On The Guillotine, a song on Morrissey's debut solo album Viva Hate, prompted Special Branch to question the singer about whether he might pose a security threat to Prime Minister Margaret Thatcher. "I am drilled and recorded on tape for one hour under the penetrating glare of Special Branch."